So, I think I probably knew about this book pretty much a year before it even came out, even before it had a cover. For those of you who don't know, I happen to be a huge fan of Maggie Stiefvater. Huge. I could probably use this entire review to just rant about her, but this is a book review, not a fangirl rant. But when the opportunity came when Maggie did her launch for The Raven Boys in my state, it's safe to say that the day was filled with fangirling, squeeing, and hyperventilating. Plus, I met my best bud, Monica from Cover Analysis! That was a fun day. When it came to the book, I'm wasn't exactly sure how to explain it. There's Blue, a daughter to a family of psychics, but has none of their powers of premonition or clairvoyance and such. However, she's got this ability to amplify a psychic's power, and that's why her family keeps her around. (Kidding! Her family loves her!) And there was something about Blue that I really liked about her. She's one that I can easily relate to. Plus, she doesn't try to try. What I mean is that she isn't fake when she's with the rich and adventurous Raven Boys. The main part of the story is that Gansey and his friends Noah, Ronan, and Adam are on this quest to discover where this Welsh king is buried. It has to deal a lot with the theory with ley lines, and if you don't know what lay lines are, you're not alone. If I had not gone to the launch, I'm not sure I would even understand the topic well enough to understand it in the book. So if you're curious about ley lines, go here. The idea of The Raven Boys was so original! I absolutely loved it. The future books to this series have plenty of potential. Unfortunately, I thought the beginning was a little slow. I would get bored, and I understand what Maggie was trying to do was create anticipation and suspense, but I really wanted it to get to the point. Things did pick up right around the middle of the book, however, so I can't complain too much because I extremely enjoyed the book. The Raven Boys, I think, rivals The Scorpio Races in its genius. I thoroughly enjoyed The Scorpio Races and its originality and with that piece, I felt that Stiefvater had truly outdone herself. I was wrong. Out-of-the-ballpark-wrong. 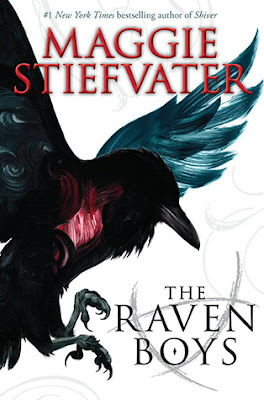 If anything, Stiefvater has outdone herself with The Raven Boys. The Raven Boys is not your average book in any way possible. It was mysterious and dark, adventurous and quirky in a way that you can only identify as Stiefvater's work. I can tell you right here that it is one of my top favorites of the year. My library just got this book, so I'll be picking up a copy when I see it there!! You've definitely convinced me I must pick this one up. While I have liked Maggie Stiefvater's other books, I'm not a huge fan of them, and The Scorpio Races wasn't really my thing. I'm glad that you still really loved this one despite the slow beginning! And the concept sounds SO unique and original, I'm excited to read about it! I started this one last week, and haven't made much progress as I've been distracted by better things (Days of Blood and Starlight). It's been pretty slow for me too, but hopefully when it picks up I'll enjoy it as much as you did! I agree with you on the whole it needed to pick up and everything. I may have skimmed but I WENT BACK AND RE-READ so no worries! :) So happy it made it to YOUR FAVORITES OF THIS YEAR! :) There was so much foreshadowing and ANEEQAH! THERE WAS PLENTY OF FANGIRLING.